Oil on canvas, 37 x 50 cm. 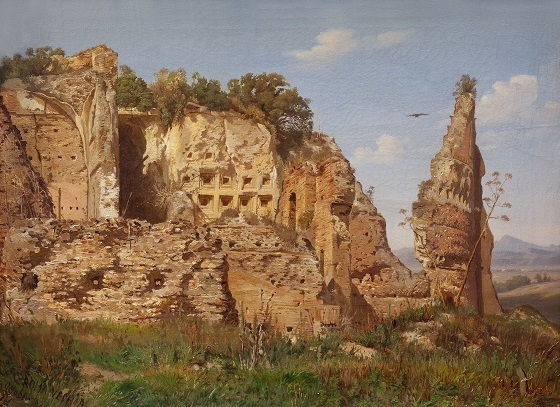 In a scene set in a landscape somewhere southeast of Rome, an ancient ruin is gradually being conquered by the surrounding nature. Trees and vegetation have established a foothold on the top, while the building itself takes the shape of the side of a cliff. The original shape of the building can still be made out beneath the trees and vegetation; for example, the remains of a hall with a covered dome and a barrel-vaulted room with cassettes can still be seen. The ruin is presumably that of the great Villa of the Quintilii, originally built by two senators and brothers around 200 BC. It was later confiscated by the Roman Emperor Commodus and further expanded by a succession of emperors. The compacted and complicated form of the dilapidated villa shows a break with the traditional rigour of architecture paintings from the Danish Golden Age.